Please log in to see membership pricing. 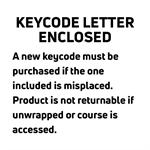 KEY CODE LETTER ENCLOSED - Code is redeemable and course is accessed at HumanKinetics.com. A new key code must be purchased if the one included is misplaced. Not returnable if unwrapped or course accessed. This textbook option is ideal for a candidate looking for a supplement to the textbook and/or a guided reading plan. You will be able to download and print a certificate upon completion. Other options are available for purchase at HumanKinetics.com. The content of the National Strength and Conditioning Association’s (NSCA) Certified Personal Trainer (NSCA-CPT®) Online Study Course reflects the weighting and scope of the NSCA-CPT exam, which is widely recognized as an esteemed credential for personal training professionals. The NSCA and Human Kinetics jointly developed this online course to help people study for the NSCA-CPT exam. This online study course works in tandem with the materials presented in NSCA’s Essentials of Personal Training, 2nd Edition, to offer a practical and efficient method of studying the content assessed on the NSCA-CPT exam. The NSCA-CPT Online Study Course has varying levels of recall, application, and analysis learning activities for each primary objective designed to reflect the weighting and scope of the NSCA-CPT exam. Featuring over 120 interactive learning activities, this online study course offers scientific knowledge and practical application and pinpoints the information required for preparing for the exam. The content covered relates directly to the on-the-job duties and responsibilities of a certified personal trainer, and an end-of-course test evaluates the learner’s content knowledge, mimicking the scope and difficulty of the actual certification exam. Current certified professionals who complete the course and pass the test can earn continuing education units (the number is determined by each organization). 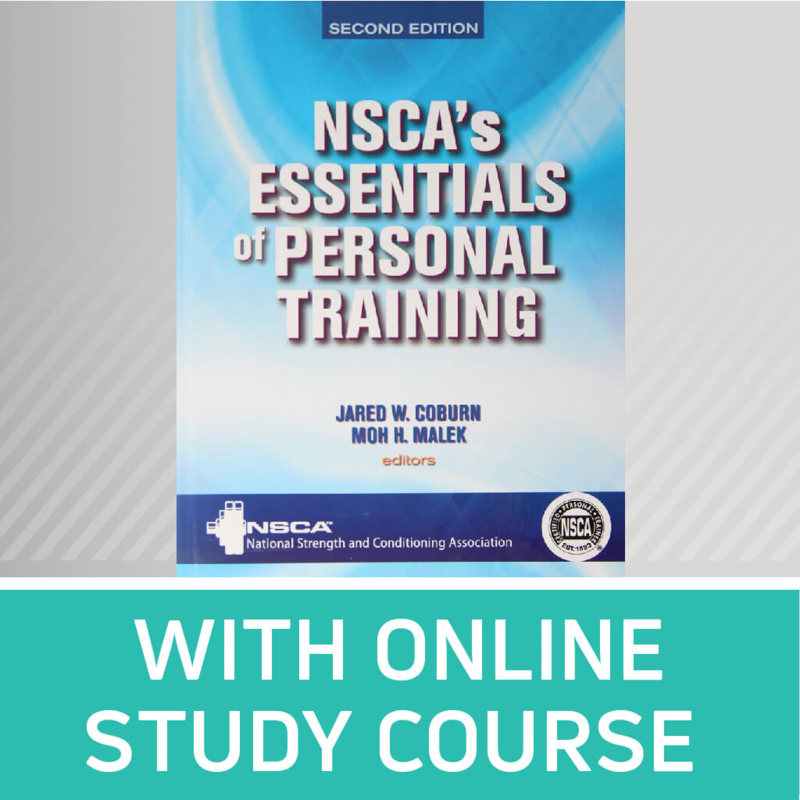 The course is supplemented by content from NSCA’s Essentials of Personal Training, 2nd Edition, the primary textbook of the NSCA for preparing for the NSCA-CPT exam. This textbook also serves as a valuable professional reference after the course is completed. The information presented in the course assists exam candidates in the studying process. It should not be considered the only method of preparing for the NSCA-CPT exam. Ultimately, each candidate’s academic, practical, and test-taking abilities will dictate the effectiveness of the preparation materials. The information in this study course should increase the likelihood of passing the NSCA-CPT exam, but it does not guarantee a successful performance. Determine compatibility between a client and a personal trainer. Complete an agreement between client and personal trainer or an agreement between client, personal trainer, and fitness facility. Administer an informed consent and release of liability form. Administer a detailed medical history and health appraisal form and a lifestyle questionnaire (including exercise history) and, if necessary, obtain a medical release from the client’s primary physician. Evaluate and interpret medical history and health appraisal form and lifestyle questionnaire. Recognize when to refer a client to, or seek input from, an appropriate healthcare professional. Evaluate and interpret the results of a health and fitness evaluation. Identify the personal trainer’s scope of practice regarding nutrition recommendations. Conduct a review of a client’s dietary habits (e.g., recall, history, or food records). Communicate basic information regarding daily caloric needs. Recognize the signs and symptoms of an eating disorder. Discuss the results of a fitness evaluation with a client to determine needs and goals. Discuss results of dietary habit review with a client to determine needs and goals. Discuss health-related lifestyle habits (e.g., smoking, alcohol use, etc.) with a client to determine needs and goals. Determine the motivational and coaching techniques that will be effective for a client. Select the exercise modality or type. Determine the order of exercises or exercise components. Determine exercise volume (including sets and repetitions) and duration. Determine rest interval length and work-to-rest ratios. Determine the rate of exercise progression. Understand periodization concepts and applications. Select the warm-up and cool-down activities of a training session. Explain exercise-induced changes to body structures. Describe exercise-induced changes to body systems. Determine capacities and limitations of a client with a special need or condition. Modify the exercise program to coincide with the limitations and capacities of a client with a special need or condition. Instruct a client on proper exercise technique for machine resistance exercises. Correct a client’s improper exercise technique for machine resistance exercises. Instruct a client on proper exercise technique for free weight exercises. Correct a client’s improper exercise technique for free weight exercises. Describe and teach effective spotting procedures and techniques. Instruct a client on proper exercise technique for functional training exercises. Correct a client’s improper exercise technique for functional training exercises. Instruct a client on proper exercise technique for calisthenic and bodyweight exercises. Correct a client’s improper exercise technique for calisthenic and bodyweight exercises. Instruct a client on proper exercise technique for sport-specific and performance-related activities. Correct a client’s improper exercise technique for sport-specific and performance-related activities. Instruct a client on proper exercise technique for cardiorespiratory machine and non-machine activities. Correct a client’s improper exercise technique for cardiorespiratory machine and non-machine activities. Properly monitor and maintain exercise equipment. Create a safe exercise environment according to industry standards. Recognize symptoms related to overtraining, overuse injuries, and temperature-induced illness. Recognize litigation issues and circumstances. Maintain a professional client–personal trainer relationship.